Famed for its temples and ashrams the city of Tiruvannamalai has many legendary happenings and history. The city’s history dates back to the ninth century where recorded proof were found from the Chola inscriptions in temples. Tiruvannamalai is located 185km from Chennai and houses the famed Annamalai temple on top of a hill. Legend had it that when Lord Vishnu and Lord Brahma were contesting for superiority Lord Shiva appeared as a flame and said that the one to find the source of the flame would emerge the victor. Lord Vishnu took the form of Varaha (boar) and went to find the base of the flame while Lord Brahma flew up to the sky as a swan. But the flame did not end anywhere and Vishnu came back accepting his defeat but Brahma lied about finding the top of the flame. Hence, Shiva cursed that there shall be no temple dedicated to Lord Brahma. Since Lord Shiva appeared as a flame, this place became to be known as Arunachalam associated with the Annamalai hill of Tiruvannamalai. In the year 1870 Seshadri Swamigal was born in Thondai Mandalam. When he was four years old he was nicknamed ‘Golden hand’ as everyone in his village said he brought luck by his touch. He completed his education at Vazhur and at the age of 19 he ended at Tiruvannamalai. He wandered the city for fourty years as an ascetic. It was he who took care of the saint Ramana and proclaimed as a saint to the world. Sri Seshadri died in the year 1929 and his body was buried as per the customs of a funeral for a saint. 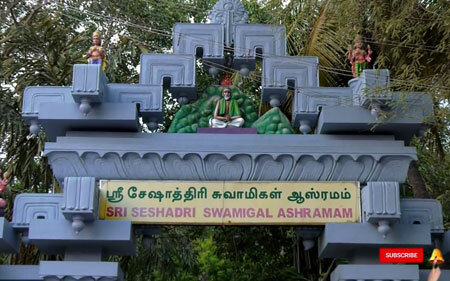 The Seshadri Swamigal Ashram was built in his memory at his final resting place. This ashram offers sanctuary to anyone looking for a chance to pray, feel blessed and reflect. This ashram generally has a peaceful aura and is one among the most visited places in Southern India. It is also located next to Ramanaasram. The ashram is a quiet and peaceful place to go to for meditation. It also has the Samadhi of Sri Seshadri and a Mandir for puja. This is one of South India’s most famous ashrams and is located in a busy street. There is a vegetarian restaurant just outside the ashram that serves good and quality food for the tourists. Other tourist attraction near this place is the Ramanaasram, the Annamalaiyar temple and Virupaksha cave.